I so love the beautiful crinkle cut and the lovely bbq flavour that this packet holds. The chips are always fresh and crunchy. Beautiful flavour. 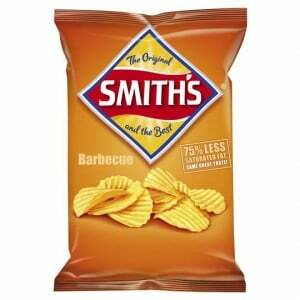 Another good flavour from the Smiths chips range. I do love Smith’s bbq crinkle cut chips,they are crunch,fresh and full of bbq flavour.Perfect for a snack on the week-end and every-one loves them! Smith’s Share Pack Crinkle Cut BBQ chips are perfect for BBQ’s, parties, the movies and any occasion when people get together and want crunchy potato chip snacks. A tasty and flavoursome BBQ chip – gets a big thumbs up! Not a bad tasting chip, though i find the smiths brand to be more fat saturated (in taste and texture) compared to others. The BBQ flavour is a great one, and the pack is a decent size to share. I love Smith’s barbecue crisps. Although bbq is not my favourite flavour, I will still gladly share a packet with no complaints. Very crunchy and delicious. Who is calling this a share packet, as my older lot think this is a single serve. Love BBQ flavour as it is so tasty and yes I will share if asked. Yep just like most smiths products I love these chips with dip and in sandwiches. There is a distinct flavor that my pellet enjoys, and I keep going back, for more. If you haven’t tried a chip sandwich don’t knock it try it for yourself. The Smith’s range is incredible the BBQ amazing, but I’m not sure who called this a share pack, as I find it very hard to do that. How would you rate Smith’s Share Pack Crinkle Cut Bbq?